UK Sport has set Britain's Olympians a target of a top-four finish in the medals table when the Games come to London in 2012. And as the body responsible for directing funding towards those would-be medallists, the message is clear. "There is no God-given right to funding," said UK Sport performance consultant Peter Keen as he revealed how the first tranche (£65.3m) of government money will be allocated. "It has got to be on the basis of merit and potential. We are being very honest with sports and saying, 'This is where you are at. If you don't deliver, the funding is going to go'." BBC Sport gauges the impact across several sports which will benefit over the next three years. Peter Keen: "Handball is a classic example of a sport with no track record of performance. But we believe, with adequate investment, it could break through to the top 12 in the world." "To compete with 12 nations is realistic in the future, but we are not competing at all at the moment. "The key thing for us is we have huge support in the international community to make handball a high-level game here (Britain already has strong links with Denmark). "We are delighted with the funding, but the hard work starts here. We have to build a structure in common with other sports that have already got a funding programme in place. "We are coming from a small base (600 registered members) but the key thing is to identify the talent. We now know we have got the funds to deliver the best talent we can." "It will have a good 'top-up' impact. 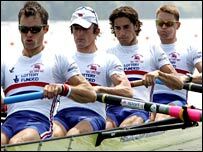 In rowing, we are well-resourced - some might say we have earned it - but we are delighted to have a top-up. "It is a significant sum of money and we will have to look at how we are going to use it. "Our medal target for Beijing is three medals, as it was for Sydney (GB won three) and Athens (GB won four). "When you consider that the biggest number of medals won by any nation in Athens was four, we are delivering what we are capable of." Peter Keen: "It is a reflection of where they are at, and £6.5m (the figure for 2007-07, due to rise to £6.8m in 2007-08 and £6.9m in 2008-09) is a significant amount of money. "If they were capable of winning eight or nine gold medals in Beijing instead of three or four, they would get considerably more funding. "But there is no likelihood of a large number of medals in 2008. In comparison with other sports, the investment is very much more directed towards the base. "But it is very likely that if our investment is successful and athletics does better, their budget is likely to go up a lot over the next four years." "This is a landmark for amateur boxing. 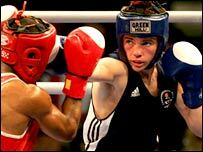 It will enable us, with a very talented young group of boxers, to build on a very robust and vibrant programme up to 2012 and beyond. "We proved in the recent Commonwealth Games that we have the talent. Now we have to work on their experience and maturity. "We are very happy with the level of funding we have received. Percentage-wise, we have fared very well." Peter Keen: "Sailing is very well supported and has already got much of their system in place. "The talent pipeline is well established and they are doing a good job at all levels. They are pretty much as good as they know - and we know - they can be. "But just to hold the position they are at in world terms in Beijing is going to be a challenge."